Before you make a decision, it's important to educate yourself on the various types of automation out there. This is a very simple counting machine. 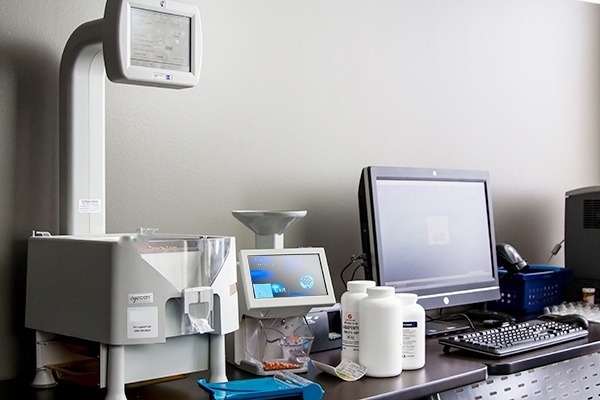 Scales are small to fit in any pharmacy setup, and most are equipped with barcode scanners. To use this device the fill tech will scan the label and then the prescription bottle. They will tare the vial, by placing it on the scale and pressing the corresponding button. This prevents the scale from counting the vial as part of the medication weight. Then, they will enter the prescription quantity and begin to fill. The count will appear on the screen as the vial is filled. Unlike other counters, scales require little to no clean up as the medication is contained in the vial during the pour. However, scale integration capabilities are minimal. There are two types of visual counting tools. These tools view or sense the pills as they are fed to the machine, either by being poured onto a tray or through an incoming bin. The first has a similar footprint to a scale counter, and uses a funnel to receive the pills. To use this machine your fill tech will pour pills into the top funnel area of the machine. They will be counted as they fall into the catch bin at the bottom. Once the accurate fill amount is reached, the tech will remove the bin and pour the medication into the vial. Some of the more advanced models, such as the KL 1 Plus, come with scanners and information screens. This allows you to scan your label and then scan the bottle to verify that you’re dispensing the right medication. Also, if it is integrated with your pharmacy management software, the two will communicate, streamlining your workflow. The second visual counter, Eyecon, is a larger model, equipped with a tray, overhead camera, and information screen. To use this model, a fill tech will pour pills onto the tray. The overhead camera “views” these pills and takes photos of them. It will notify the user if the visual of the pill doesn’t match the scanned NDC or if there are pill fragments on the tray. The images taken are stored on the local drive of the pharmacy computer to be used as verification in case a problem arises later. Like the KL 1 Plus, the Eyecon can be integrated with your pharmacy software for a streamlined process. Cabinet dispensers are the transitional automation tool between counters and robots. Cabinet dispensers have a much larger footprint than any of the counters we have described above, but they also serve as storage for the medications they dispense, freeing up space on your stock shelves. Cabinet dispensers come with a specified number of bins, a scanner, and an interactive screen. They work off the same scan technology as the scale and tablet counters. To use a cabinet dispenser you use the touch screen to indicate that you want to fill. Then, scan the label before placing the vial to the bin spout for the pills. The dispenser will release the correct number of pills into the vial, and the tech can then verify. Dispensing robots come in various shapes and sizes. They also perform different duties based on the model you choose. However, the basic premise for all is the same—the dispensing robot stores and dispenses medication when you set it to fill in your pharmacy software. When fully integrated with your management software, a prescription will be automatically filled by the robot when you indicate a fill in your software. The robot will read the prescription information and select the correct medication from its storage bins. Some of the less advanced robots require staff to label a vial and place it on a conveyer to move into the robot for dispensation of the medication. Other robots also store vials and labels. They select the vial, fill the prescription, and put the correct label on it. It is then up to your staff to review the fill to ensure its accuracy, place the vial cap on the prescription, and place in your will-call area for pickup. Because dispensing robots, like cabinet dispensers, can only hold a certain amount of medication, pharmacies generally fill their robots with their fastest moving medications, while leaving their slower moving medication to be dispensed manually. Packaging robots are great for elderly and sync patients who take many medications. They pack the medications in blister or strip packs for a single dosage. This eliminates your patients’ need for pill organizers. The packs come complete with prescription information, like date and time to take that particular medication, package contents, and barcodes for long-term care capabilities. Some packers, use blister packs to allow you to pack the capsules yourself and place them in a sealer, which places the adhesive backs on them with the prescription information. Others, like the Parata Pass, store the medication in a dispensing robot and create strip package, printing the prescription info directly on the package. There are advantages and disadvantages to both methods. Packaging by hand takes a staff member’s time and opens the door for error. However, it also allows you to include things like vitamins and nonprescription medications in their prepacked medications. To do this with a more automated packer, would free up the time of your staff and ensure accuracy, but you would have to keep all items stocked in the robot. Luckily, there are some that can hold up to one thousand different medications. Space available – As discussed above, pharmacy automation comes in various shapes and sizes, so you want to pick the right tool for the size of your pharmacy. Patient need – I’m sure we’d all love to have a packaging machine with a one thousand bin capacity, but it can be cost prohibitive. It may be better to evaluate your need and budget before splurging on an expensive purchase. Electrical requirements – As you can imagine some of these robots likely require quite a bit of energy to power and maybe even require a special outlet. If you work in an old building, electrical work may be necessary to accomodate. When researching automation tools, be sure to look at specifications on the machine. Network requirements – To ensure that your automation tool can use all of its intended functions you will likely need a network drop, including an Ethernet cable. If your pharmacy doesn’t have an extra drop available, you may need to call an electrician to create one where you intend to set up your automation tool. Once you’ve considered all the factors, you’ll be ready to choose the best automation tool for your pharmacy! What are your thoughts on pharmacy automation? Do you prefer a counting machine or a robot? Do you think pharmacy automation improves your pharmacy’s patient care?